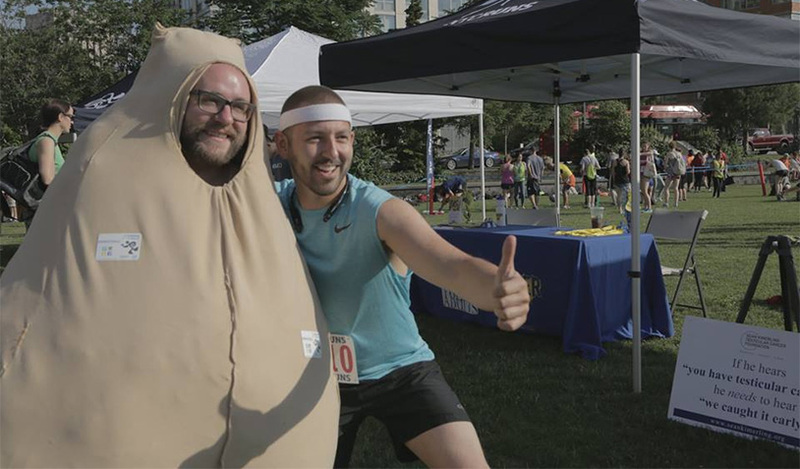 Last weekend saw the fourth annual Running of the Balls, the charity race hosted by the Sean Kimerling Testicular Cancer Foundation. As part of our outreach and fundraising mission, we set up a 5K and a 10K on Roosevelt Island each year where runners can collect pledges to support our cause. 2016 saw the event hit its fourth birthday and it was a smashing success. Runners massed for the 5K at 8:30 in the morning on Sunday, with perfectly beautiful New York summer weather providing a gorgeous backdrop. The man-sized scrotum Mr. Check ‘Em was there to cheer athletes on, and a team of dedicated volunteers kept things running smoothly. Check out an album of photos from the event here, and if you didn’t hear about it in time to donate, you can still support the Foundation’s vital mission of raising testicular cancer awareness and improving treatment by making a donation here. See you (and your balls) at next year’s race!